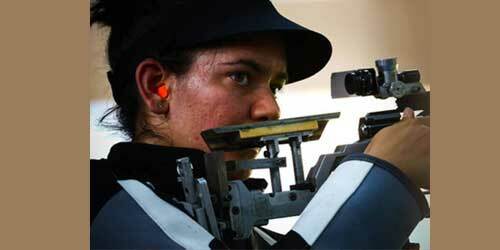 India’s Anjum Moudgil reached her second International Shooting Sport Federation (ISSF) Word Cup stage final of the year, only to finish a disappointing sixth in the women’s Rifle 3 Positions event at Munich on Sunday. Competing on day four of the year’s fourth and final ISSF World Cup Rifle/Pistol stage, Anjum became India’s third finalist of the competition when she shot 1177 in qualifying to make it to the eight-woman final in sixth position. She remained in the contention for a medal till the 40th shot of the 45-shot final, but a 9.2 on her 41st meant she finished in the same position in which she had qualified. She bowed out of the final with a score of 413.4. Compatriot Nithyanadam Gaayathri had to endure heartbreak earlier in the event, when her qualification round score of 1176, placed her ninth, just two inner 10s short of 35-year old Iranian, Elaheh Ahmadi, who qualified eighth with the same score. Ironically, it was Ahmadi, the oldest shooter in the final’s field, who won the gold in the event with a final round score of 455.4. Two Chinese shooters, Chen Dongqi and Rio Silver medalist Zhang Binbin won the silver and bronze medals respectively. In the day’s other events, Heena Sidhu was the best Indian finisher in the women’s 10m Air Pistol, shooting a score of 574 in qualifying to be placed 17th. Mahima Agrawal shot 570 to finish 36th while Manu Bhaker shot 567 to end in the 47th position. In the men’s Rapid Fire Pistol event, Olympian Gurpreet Singh and Anish Bhanwala, both shot identical scores of 571 out of 600 in qualifying to fall well short of the top six while Neeraj Kumar’s score of 549 was even lower. Monday will be the concluding day of the Munich World Cup stage and has the two mixed team event finals lined up- namely the 10m Air Rifle Mixed team and the 10m Air Pistol Mixed team. India has so far had three finalists among the eight Olympic events held. Besides Anjum’s effort, Apurvi Chandela had finished fourth in the women’s 10m Air Rifle and Om Prakash Mitharval finished seventh in the men’s 10m Air Pistol events after making it to the medal rounds.